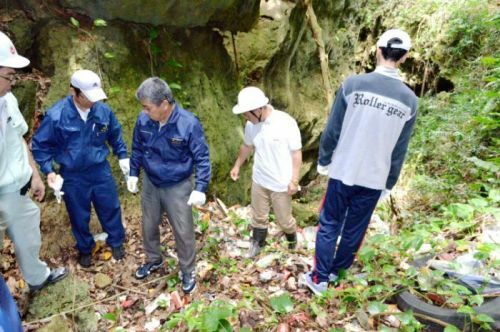 On May 12 at Mabuni, Itoman City, prefectural officials and city officials confirmed there was illegally dumped waste between rocks. On May 12, about 20 people including prefectural officials and Itoman City officials visited and confirmed a site of illegal waste dumping. Illegally dumped waste such as empty cans and household appliances have been piled up for many years under cliffs facing the coast of the National Cemetery for the War Dead during the Battle of Okinawa in Mabuni, Itoman City. Until now, volunteer groups and the city have been conducting clean-up activities, but from now own, the prefecture will discuss with relevant departments and organizations about projects that the prefecture could undertake towards the removal of garbage. A person in charge at the Itoman City Agricultural Policy Division, which owns the illegal dumping site, or “preserved forest area”, said, “We must think about doing garbage removal before bone collection work, which is concerning. It is difficult for the city and the private sector to take care of the issue due to budget problems. I would like to seek the cooperation of the prefecture and the country as part of a postwar process. The site of illegal dumping spreads about 500 meters below the cliff behind the National Cemetery of War Dead from the Battle of Okinawa.